Having created 4 samples only using horizontal stitches it was great to see that module 1:3 starts to explore stitch direction. In this section you had to create a 9 box grid and unlike the previous challenges where the objective was to make each section distinctive in this one you were asked to create a grid where the sections work in harmony. I did a few samplers for this section. The first very basic and angular (pic above), the second introducing curves and circles. I kept it very basic as I wasn’t sure how well I’d manage the circles – next time I’ll be more ambitious. And the third I was looking at more of a blocking of textures and patterns. 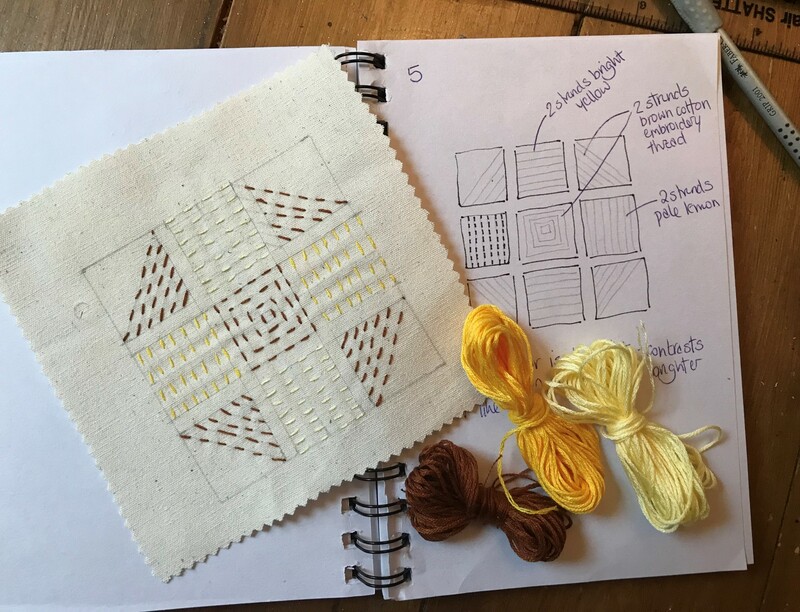 The samples take longer to complete as you have to think about the design a lot more – I found it useful to sketch out the design before I started whereas in the earlier challenges sketching in the notebook was just to record what I had done, threads I’d used, etc.